RAMALLAH (Ma’an) –The Palestinian Prisoners Society (PPS) said Monday that 65 Palestinian prisoners affiliated to the left-wing Popular Front for the Liberation of Palestine (PFLP) have started an open hunger strike in Israel’s Megiddo prison.According to a statement released by PPS, a lawyer who visited Israel’s Megiddo and Gilbou prisons on Sunday said that 60 PFLP-affiliated prisoners started a hunger strike in Megiddo Sunday, and five PFLP-affiliated prisoners were expected to start a hunger strike in Gilbou prison Monday.The decision to start the hunger strikes, added the lawyer, was in protest against Israel’s decision tosend PFLP-affiliated prisoner Bilal Kayid to administrative detention without trial for six months, after he was expected to be released after completing a 14-year prison sentence.Kayid began his own hunger strike on June 13 in protest of the decision. 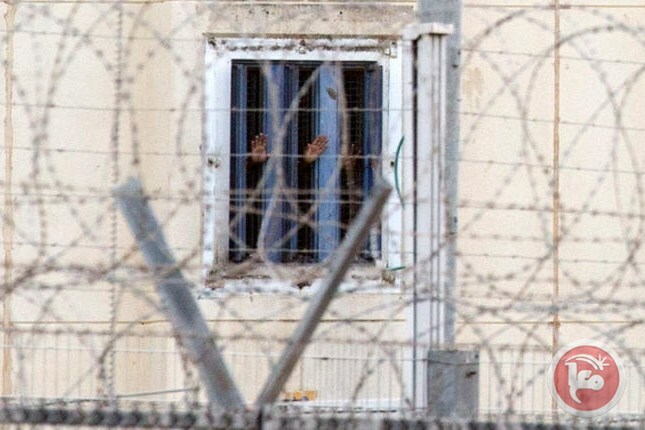 Following news that other prisoners were expected to join his strike, Israeli forces raided Israel’s Eshel prison, assaulting the prisoners who had announced their intent to strike. Dozens of Palestinians near Kayed’s home town in Nablus also reportedly gathered to protest his administrative detention on Tuesday. Kayid, from the village of Asira al-Shamaliya near Nablus in the northern occupied West Bank has been in Israeli custody since 2001 for alleged involvement in the Abu Ali Mustafa Brigades — the armed wing of the PFLP. Israel considers the majority of Palestinian political parties to be “terrorist organizations.” As a result, most Palestinians who participate in the political arena in the occupied Palestinian territory risk being imprisoned by Israeli authorities. According to the prisoner’s rights group Addameer, there are currently 7,000 Palestinians held in Israeli prisons, 715 of whom are held under Israel’s policy of administrative detention. DAMASCUS, (PIC)– More than 3,000 Palestinian refugees were killed in Syria over the past five years, while 1,077 Palestinians were arrested by the Syrian regime, a rights group revealed Monday. The Action Group for Palestinian Refugees in Syria documented in a new report issued Monday that 3,263 Palestinians were killed in Syria, 1,081 of them died in airstrikes on their houses. 719 refugees were killed during clashes, while 447 Palestinians were tortured to death in Syrian regime’s prisons. The report pointed out that 293 Palestinians were killed by snipers’ fire, while 187 others were starved to death in the besieged Yarmouk refugee camp. According to the report, 1,077 Palestinian refugees are still held by Syrian regime forces including minors and women, while 285 other refugees have gone missing. RAMALLAH, (PIC)– Israeli Occupation Forces (IOF) at dawn Monday arrested two journalists: Adib al-Atrash from al-Khalil and Nasereddin Khasib from Ramallah bringing the number of journalists detained in Israeli jails to 22. Palestinian Prisoner Society revealed, in a statement, that both journalists have recently obtained their Master degrees from a university in Cyprus. The Society highlighted that among the imprisoned journalists is captive Mahmoud Issa who is the oldest prisoner with the highest sentence. He has been arrested since 1993 and is serving a life sentence. Among the captives also is the female journalist Samah Dowaik from Occupied Jerusalem. She is detained for alleged incitement on Facebook. Journalist Bassam al-Sayeh is also held under custody. He is suffering from leukemia and bone cancer in addition to weak heart muscle and problems in the lungs. The Society pointed out that Israeli forces hold five Palestinian journalists under the illegal administrative detention with no charges or trials. LONDON, (PIC)– The Action Group for Palestinians of Syria announced that 17 Palestinian refugees in Syrian jails have died of torture since the beginning of 2016. In a report on Monday, the Action Group revealed that over 1,077 Palestinian captives face vague fates in Syrian regime prisons including children, women, elderly people, siblings and entire families. Hundreds of them died of torture as well. According to a report issued by the Amnesty International, 530,000 Palestinian refugees live in 12 refugee camps in Syria, according to UNRWA, in addition to two other camps unrecognized by the organization. The Amnesty International estimated the number of Palestinian refugees who were displaced inside Syria at 235,700. Can Palestinian right of return issue be solved? One of the main reasons for the emphasis on the 2002 Arab Peace Initiative as a basis for a future two-state peace process is that it also entails, in the view of the United States and the European Union, an expression of the Israeli position on the contentious issue of the Palestinian right of return. The initiative says on this point that a joint solution by the parties to the problem of Palestinian refugees should be “agreed upon in accordance with UN General Assembly Resolution 194.” While the initiative is based on a resolution that calls for the return and resettlement of Palestinian refugees to their pre-1948 homes, it still stipulates that the resolution of the issue be agreed upon with Israel. For the Palestinian national leadership, this is the crux of the conflict. The return of the refugees is the heart of their historical narrative, namely, that Israel was established by robbing the Palestinian inhabitants of their land and homes. Peace and justice can only prevail in this with the return of Palestinian refugees from their diaspora. For Israel, this amounts to national suicide. An influx of approximately 5 million Palestinian refugees — those who left and their descendants — into sovereign Israel would put an end to Israel as the national homeland of the Jewish people. Therefore, all Israeli governments have rejected the right of return and treated this demand as an existential danger. The issue has been brought up, although only marginally, in all previous peace negotiations between the parties, including in the Oslo talks. The current Palestinian leadership is well aware that the issue is taboo to Israel. President Mahmoud Abbas, originally from Safed in northern Israel, alluded to this understanding when he told several Israeli journalists in a 2012 interview on Israel Channel 2 that while he wishes to visit his original house, he does not seek to return there. Following up on the June 3 Paris conference, policy planners in the Palestine Liberation Organization (PLO) are working on creative solutions to all the permanent status issues while maintaining the principles of the Palestinian national position. A senior PLO official told Al-Monitor on condition of anonymity that Palestine will never give up on the principle of the right of return, saying, “This is our historical narrative and dream.” Yet, he added, in return for a two-state solution based on the 1967 lines, the PLO would be ready to discuss practical solutions in line with several important elements. The first element is that the PLO’s main aim is the achievement, in the foreseeable future, of a Palestinian state based on the 1967 borders with agreed upon land swaps and East Jerusalem as its capital. He stressed that the issue of the Palestinian refugees is central to putting an end to the Israeli-Palestinian conflict. Another central and essential element would be Israeli recognition of the injustice done by Israel to Palestinian Arabs in 1948 and international recognition of the principle of the right of return. In practical terms, this means that the PLO would be ready to explore the possibility of Israeli-controlled Area C in the West Bank (excluding minor settlement blocs) being designated land on which Palestinian refugees can be resettled in an international effort with Israeli economic contributions. With that in view, a symbolic (agreed upon) number of the originally expelled Palestinians who are still alive (between 30,000 and 50,000) would be allowed to settle in sovereign Israel within the context of family reunion. All other refugees would be entitled to international compensation to be decided by a multilateral committee headed by Canada and the United Nations. The PLO official added that Palestine would see in such a solution the implementation of UN General Assembly Resolution 194. Undeniably, this issue is probably the most difficult decision that a Palestinian leader would have to face, and indeed, negotiation should take place on the practical elements of the refugee problem. A senior Israeli Foreign Ministry official who worked on the issue in past multilateral talks told Al-Monitor on condition of anonymity that although these ideas were interestingly creative, there was no chance that Israel would accept them. Israel must on the one hand comprehend the centrality of the issue to Palestinians, yet insist on negating the Palestinian right of return on the other. The historic Israeli-Palestinian compromise should be a right of return of Jews to sovereign Israel within the 1967 lines and a right of return of Palestinians to the future Palestinian state within its new borders. In the meantime, the Israeli government would do well to reflect also on creative practical solutions to this critical narrative-based issue. Yet, for that to happen, Israel needs a government that is interested in a two-state solution. The number of Palestinian prisoners held in Israeli jails has increased to 1,800, the Safa news agency reported a PLO official saying. Head of the PLO Prisoners and Freed Prisoners’ Committee, Isa Qaraqe, said the most critical cases are those of 20 prisoners who are currently being held in Ramala prison hospital, half are disabled and paralysed. He said that there are ongoing efforts to highlight the issue of the prisoners’ suffering which, in some cases, continues until their death due to the lack of proper medical care and medicines. Freed prisoner Bassam Abu-Akar, who spent 12 years in jail, called for an international interference to save the life of the sick prisoners whose life is in sever danger. Saudi Arabia is joining a call from the U.S. to intensify the attack on ISIS in the wake of a mass murder at an LGBT nightclub in Orlando. Meanwhile, the Gulf kingdom continues to oppress LGBT people and promote the very same extremist ideology that leads to terrorism. MINNEAPOLIS — In the wake of the Orlando massacre, the United States and Saudi Arabia are vowing to turn up the heat against terrorists and religious extremism in the Middle East. But these allies have a history of supporting the same tenets of religious extremism that lead to terrorism and repression of human rights. On June 13, U.S Secretary of State John Kerry hosted Saudi Deputy Crown Prince Mohammed bin Salman at Kerry’s home in Washington, where the pair shared dinner. The meeting came a day after Omar Mateen killed 49 people and wounded 53 more at a LGBT nightclub in Orlando, apparently pledging allegiance to Daesh (an Arabic acronym for the terrorist group known in the West as ISIS or ISIL) during the attack. In another statement quoted Thursday by Al Arabiya English, Kirby praised the Saudi role in Syria. “If it were not for Saudi leadership, we wouldn’t have that first meeting of the Syrian opposition groups back in December in Riyadh,” he said. Kirby suggested the two nations were relatively unified in their plans for the civil war-torn country. “If you’re asking if there’s this big philosophical divide between the Saudis and the United States on how to move forward on the ground in Syria, the answer is ‘no,’” he said. Both Hillary Clinton and Donald Trump advocated increased bombing campaigns against Daesh last week, echoing similar calls for so-called “humanitarian” intervention in Syria. The Wall Street Journal reported on Thursday that 51 State Department officials signed onto a “dissent channel cable,” a form of internal complaint, demanding regime change in Syria. Yet there’s mounting evidence that the U.S. and Saudi Arabia both played important roles in the creation of Daesh and other extremist groups. The authors of the DIA report point to the regional branch of al-Qaida, the Muslim Brotherhood, and groups following Salafist or Wahhabi Islam as the major groups driving the civil war. Wahhabism is an extremist form of Islam that’s been repeatedly tied to Saudi Arabia’s wealthy ruling families. Diplomatic cables in WikiLeaks archives depict Saudi Arabia as a “cash machine” for these extremist groups. And U.S. weapons and supplieshave frequently fallen into their hands, often through failed efforts to train so-called “moderate” rebels in Syria. Despite joining calls to fight terrorism in the wake of the nation’s worst massacre of LGBT individuals, homosexual behavior is still punishable by the death penalty in Saudi Arabia. In April, the Saudi ambassador to the U.N. insisted that LGBT people have no human rights under international law. Saudi officials even suggested executing LGBT people who come out of the closet via social media, according to a March report from Vocativ. In a June 14 analysis of Saudi Arabia’s oppression of LGBT people and other human rights violations, Ben Norton, a politics staff writer at Salon, criticized the country for its hypocrisy in the wake of the Orlando killings. “[T]he kind of extremism that led shooter Omar [Mateen] to kill 49 people and injure another 53 is institutionalized in the theocratic Saudi absolute monarchy,” he wrote. GAZA, (PIC)– A 13-year-old Palestinian girl at dawn Monday was injured by Egyptian bullet fire in southern Gaza Strip. According to the inhabitants of the Rafah city, to the south of the Gaza Strip, the Egyptian army opened fire on Palestinian civilian homes in Tel al-Sultan neighborhood, wounding a child. Palestinian medics said the casualty, identified as Malak al-Kadhi, was rushed to the Abu Youssef al-Najar hospital in Rafah so as to be urgently treated for the wounds inflicted by Egyptian bullet fire. A number of Palestinians, including children, were killed or wounded by the Egyptian army and naval forces along the borders with Gaza. Secretary of the Syrian Coalition’s political committee Riyad Alhassan said that the Assad regime’s refusal to implement humanitarian provisions set out in the UN Security Council resolution 2254 is the prime cause for the ongoing flow of refugees to neighboring countries and Europe. On the occasion of the World Refugee Day, Alhassan said that millions of Syrians have been displaced because of the constant bombardment by the Assad regime on liberated cities and towns. He pointed out that Articles 12 and 13 of UNSC resolution 2254 clearly called for stopping indiscriminate bombing of civilians, lifting the blockades on besieged areas, allowing the delivery of humanitarian aid to those in need, and releasing detainees. At least 64 civilians, including 10 women and 13 children, were killed in aerial bombardment by the Assad regime and Russian forces on rebel-held areas across Syria on Sunday. The victims included 37 civilians who were killed in Aleppo, which continues to bear the brunt of the Assad regime’s and Russia’s aerial attacks. Alhassan ascribed the increasing flow of refugees to plans by the Assad regime, backed by Iran, to bring about demographic change in Syria through the systematic displacement of the population of entire areas. Alhassan reiterated the Coalition’s calls for the resumption of the Geneva negotiations as soon as possible to bring about a political solution in Syria through the formation of a transitional governing body with full powers and the stepping down of Bashar al-Assad as the only way to stop the killing, destruction and displacement in Syria.